Clarisa (Barnhouse) Huston was born in April 1850 in Somerset, Somerset County, PA, the daughter of Harrison and Catherine (Minerd) Barnhouse. She and her husband were pioneers of Eastern Kansas. 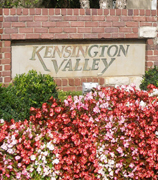 At the age of six, in 1856, Clara and her parents and young siblings moved to East Liberty (Dickerson Run), near Vanderbilt, Fayette County, PA. There, she was raised to adulthood and joined the Cumberland Presbyterian Church. On Feb. 23, 1871, when she was the age of 21, Clara married Boyd W. Huston (1840-1912), the son of William and Rebecca (Hutchinson) Huston, of Scotch-Irish heritage. Boyd "was born and reared on the old Huston farm at Dawson," said the Connellsville Daily Courier. His parents "were among the most prominent and widely known residents of Dawson." The wedding took place at the home of Clara's parents in East Liberty, by the hand of Rev. J.P. Baird. A brief announcement in the Uniontown (PA) Genius of Liberty noted that Boyd was "of Missouri" which may reflect his interest in the Kansas City region, which encompassed both Missouri and Kansas. At the time of marriage, Clara knew full well that she and her new husband would leave soon and settle in Kansas. A year earlier, Boyd had gone to "the far West" along with Eli Huston and Frank Galley, reported the Genius of Liberty. News coverage about Boyd's 1870 scouting trip to Kansas City, and his marriage to Clara the following year. River ferry carrying passengers to Kansas City. And so shortly after marriage, the newlywed Hustons traveled to Pittsburgh, PA, where they boarded a boat, ready to begin their journey. They and their belongings floated down the entire length of the 981-mile Ohio River, to Cincinnati, OH, Louisville, KY, and thence to Cairo, IL, where the Ohio River emptied into the mighty Mississippi River. At Cairo, their boat then turned into the Mississippi and, against the current, headed northward toward St. Louis, MO. From St. Louis, their boat then maneuvered westward into the Missouri River, making its way the entire width of the state of Missouri for another 240-plus miles, arriving to Kansas City, where they finally dis-embarked. 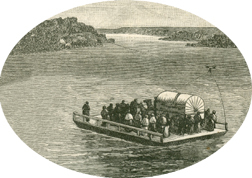 Seen here: a Frank Leslie's Illustrated Newspaper sketch of a river ferry carrying a wagon and passengers to Kansas City. Interestingly, Bertha conceived her first child shortly after marriage, and one can only imagine the physical effects of an early pregnancy during a cross-country voyage. Upon arriving in Kansas, the Hustons made their way to the town of Spring Hill, about 22 miles to the southeast of Kansas City, a prime location which Boyd must have identified during his 1870 scouting trip. They remained in Johnson County for the rest of their lives. Interestingly, the famed Santa Fe Trail -- linking Kansas City with Santa Fe in New Mexico -- ran through Olathe, Johnson County. The trail was a major route between 1822 and 1880, opening up the Southwestern United States to settlement and commerce to pioneer settlers traveling together in wagon trains. Today, ruts of the trail may still be seen in the area, and a monument stands at the Johnson County Courthouse. 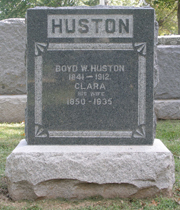 The Hustons went on to have seven children, of whom five survived to adulthood -- Bertha Huston, Etta Hemphill, Frank Huston, Harry Huston and Jesse S. Huston. The two who died young were son Marcy B. Huston -- named after a beloved uncle -- who passed away on Jan. 17, 1881 -- and Alvie E. Huston, who died in 1887 at the age of one year. Both babies rest for eternity beside their parents. By the time the Hustons arrived, Spring Hill had been a town for 16 years, receiving its post office on Oct. 5, 1857. Within a year or two, said a booklet prepared for the town's centennial in 1957, "Spring Hill had progressed into a growing community with settlers, moving west, stopping off and some of them settling. Drivers of the stage line, which ran from Kansas City, Missouri, to Ft. Scott, Kansas, changed horses at Spring Hill." Kansas City, KS, more than a decade after the Hustons arrived there on a boat from Pittsburgh, PA (from Frank Leslie's Illustrated, May 7, 1887). In all, the Hustons and their growing family spent about seven years in Spring Hill and nearby Ocheltree, where they were members of the Presbyterian Church. During that era, a new church building was erected, a major milestone of their spiritual life in that community. When Clara's father died in 1875, about four years after her move to Kansas, she received the heart-breaking news via telegram. Traveling home, she "arrived on the 6 o'clock train at Dawson ... to attend the burial," said the Genius. In about 1878, Clara's sister and brother in law, Susan and Jesse Anderson Stoner, also left Western Pennsylvania and joined the Hustons in Johnson County. The Stoners resided for periods in Ocheltree; Mount Ida; Ottawa, Franklin County (circa 1899); and Paola, Miami County. Susan and Jesse later moved to Kansas City, remaining there until 1911, when they relocated again to Colorado, settling for good in Palisade, Mesa County. Around 1878, the Hustons themselves relocated again, at about the time when their eldest daughter was age seven. They moved to the "old Riley place" in the Fairview School neighborhood, about seven miles northeast of the town of Olathe, Johnson County. There, they would spend the rest of their long lives, as would all of their adult children. After renting their farm for four years, Boyd bought the 120 acre tract outright in December 1881 from Joseph T. and Clara M. Ward, for the sum of $3,400. The following year, in July 1882, he bought another tract from its owner, Lewis Fitzgerald, president of the Mercantile Trust Company of the City of New York. The precise location of the first tract is Section 12, Township 13, Range 24. The designation of the second tract is Sections 24 and 25, Township 13, Range 24. Crowded, unpaved street in Lenexa, near Olathe, early 1900s. Even though Clara lived in only one place from 1878 to 1935, she alternately was listed as being from "Lenexa" and "Olathe." The Hustons joined the First Presbyterian Church at Olathe, said the Johnson County Democrat, "during the pastorate of Mr. Stout." They were members for many years, and even after Boyd's death in 1912, Clara was "one of the most faithful attendants at the church until she suffered an attack of apoplexy" in about 1931. The federal census of 1880 shows the Hustons residing near Olathe in Oxford Township, Johnson County, where Boyd's occupation was given as "farmer" and Clara's as "keeping house." At that time, four of their children had been born. Samuel Savage and John Akins lived under their roof as farm laborers, and 21-year-old Jane Barnhart also resided in the home as a servant. Interestingly, living two doors away were Samuel and Mirna J. Huston, he age 30 and born in Indiana, and she age 21 and born in Iowa. What the connection between the two households of Hustons is a mystery for now. Modern neighborhoods on the Hustons' old farm, branching off Switzer Road near Blue Valley High School No. 3 and the First Evangelical Free Church Grace Garden Preschool. Clara and Boyd returned to their home county of Fayette in September 1891 for a visit with family and friends in Dawson. He told a local correspondent for the Connellsville Courier that "Dawson has grown into a small city during his absence, as he views some of the handsome residences and business houses that have been erected." The Hustons made more trips back to Fayette County to visit Clara's married sister, Esther (Barnhouse) and Christian Stoner Freed. On several occasions the two couples had their pictures taken together. They gave away these photos to some of their cousins, as evidenced by some of the unexpected places the photos have turned up. Their last visit back home was in about 1908. Seen here is a snapshot of the Hustons and Freeds posing together, with the Hustons seated on a porch swing, and the Freeds standing behind. Esther and Christian likewise went to lengths to visit the Hustons. In 1899, the Connellsville Courier reported that the Freeds had left "for Ottawa, Kan., where they will be the guests of relatives for a month." 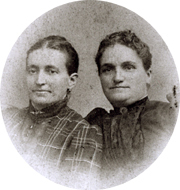 Seen here: Clara with her sister Esther Freed (right), taken at Connellsville's Porter photography studio. Esther is thought to have used family photos of this nature as gifts for relatives. The original of this image was found in the 1990s in the collection of a granddaughter of another of their first cousins, Civil War veteran Martin Miner, of Normalville, Fayette County. In about 1906, sons Harry and Jesse Huston, joining with their cousin William Stoner, traveled back to Vanderbilt for a reunion party hosted by their aunt and uncle, Esther and Christian Freed. In a story headlined "Freeds Entertain," the Connellsville (PA) Courier reported that the men were "the guests of friends and relatives here and in Dunbar township. The affair was in the form of a reunion, about 26 cousins and other relatives being present. Music and games were the amusements of the evening until a late hour, when an elegant luncheon was served." The 1900 census shows Boyd, age 59, and Clara, 50, making their home in Oxford Township, with daughter Bertha (28), Harry (21) and Jesse (19) still in the household. In 1900, Boyd added to his land ownership with the purchase of a a five-acre tract from Nathan Zimmerman for $2,025, in Section 25, Township 13, Range 24. In 1907, he further expanded his holdings by acquiring a portion of Section 24, Township 13 and Range 24. The seller was the estate of Esther R. Beedle. To finance the 1907 purchase, Boyd and Clara took out a mortgage from Hattie Mattfeldt, of nearby Wyandotte County, in the amount of $1,200. The arrangement allowed the Hustons to pay off the loan in two years, with one-half due at the end of year one, at a five percent interest rate. The census of 1910 lists Boyd and Clara, and sons Frank, Harry and Jesse, living under one roof. The sons all were farmers and farm laborers on the home farm. When the Genealogical and Personal History of Fayette County, Pennsylvania was published in 1912, Clara and Boyd were mentioned on page 884 of volume III, in a section devoted to Boyd's great-grandparents, Joseph and Margaret (Cunningham) Huston. The brief text read: "Boyd W., born March 7, 1841; married Clara Barnhouse; after the civil war they removed to Kansas." The landmark book was produced by the Lewis Historical Publishing Company of New York, under the editorial supervision of John W. Jordan, Librarian of the Pennsylvania Historical Society of Philadelphia. Boyd died at the age of 72 on Dec. 17, 1912. He was buried in Pleasant Hill Cemetery with his infant children Marcy and Alvie. The Olathe Register printed a short obituary, saying Boyd was "a well known farmer ... [and] one of the early settlers of this county and was highly esteemed by his neighbors and multitude of friends in the county." His old hometown newspaper, the Connellsville Courier, reported Boyd's death on the front page, and said "His many relatives and wide circle of friends in Fayette county will regret to learn of his death." In widowhood, Clara "continued active in her home," said the Democrat, and was named in the 1922 Connellsville newspaper obituary of her sister, Esther Freed. She outlived her husband by 23 years, almost a quarter of a century. During these years, she made her home with her unmarried daughter Bertha, who likely was her primary care giver, and with her bachelor sons Frank and Harry. She also made a land acquisition of her own in 1918, buying a five-acre tract from Joseph and Ada Divelbiss for $625, located in the adjoining Section 25, Township 13, Range 24. Clara suffered a stroke of paralysis in about 1931, at the age of 81, but lingered in this condition for about four years in her old farm home. Clara passed away at the age of 85 in 1935. She was laid to rest beside her husband at the Pleasant Valley Cemetery in Stanley, Oxford Township, where her son Frank served on the board of directors. A tall, substantial granite marker later was placed on the grave, with the names of their deceased children Marcy, Alvie and Bertha inscribed on the back. Because Clara died without leaving a will, she was considered "intestate." That meant that her real and personal property assets automatically descended to her children. This included the family farm as well as income and savings certificates of the First Federal Savings and Loan Association of Olathe. The estate was not administered in Johnson County Probate Court for another 13 years, until 1948. By that time, daughters Etta Hemphill and Bertha Huston also were deceased, further complicating the picture, as Etta's rights of inheritance had passed to her four children, R.W. "Bert" Hemphill, Maude Lowe, Mary Tippin and Margaret Dodds. To determine the correct descent of assets so they could be properly divided, Clara's son Frank Huston filed a petition in Probate Court, with a county judge making a final determination. The Huston obituaries were found on microfilm during a September 2010 research visit to the Johnson County Central Resource Library in Overland Park.